The train due on platform one will not be arriving for the foreseeable future – because it is too big. France’s national railway operator SNCF has ordered 2,000 new trains that are too large for many of the stations they are due to serve. The train operator has admitted failing to verify measurements it was given by the rail operator before ordering its new rolling stock. The costly mistake has sparked an urgent €50m operation to modify 1,300 platforms on the regional network. SNCF has admitted that one in six regional train stations is affected. In the worst cases it has discovered two trains can no longer pass each other on adjacent lines. The new regional trains, known as TERs (trains express regionaux), are intended to upgrade the network and were based on measurements provided by national rail operator RFF. However, RFF sent SNCF the dimensions of stations built less than 30 years ago. It was then discovered – after it was too late – that the trains, due to go into service from now until 2016, were too big by several centimetres for stations built more than 50 years ago. 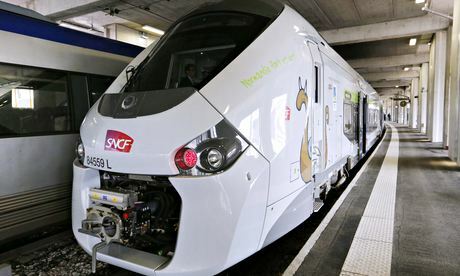 SNCF said only 341 trains – 182 from Alstom and 159 from Bombardier – were affected. However, satirical news magazine Le Canard Enchainé insisted 1,000 of the trains had been ordered from Alstom and 860 from Bombardier, making a total of 1,860 trains that were too wide for many of the stations they are to service. The French minister of transport described the situation as absurd and a “comic drama”. He blamed the previous centre-right administration’s decision to separate the rail network from the train network. How do you separate the rail network from the train network?! Absurd!! And it seems this hair-brained lack of thought has a history that transcends political philosophy. Both the conservatives and liberals proved to be too stupid or too lazy to use a tape measure. .
Are the French absolutely certain that this order and specifications weren’t actually placed by an Obama administration manager, department head or czar?? ?